To be able to provide the horse an optimum diet it is necessary to look at its original feeding habits. Horses are generalist browsers. The bulk of the diet comprised of roughage ie a variety of pasture grasses, weeds and pickings from shrubs and trees. Concentrates were eaten only when available as seed heads formed. They browsed in herds with one horse keeping sentry duty in turns when the others had REM sleep which lasts around 30 minutes at a time. Changes to diet were gradual and dictated by how far they moved per day and seasonal changes. Horses eat for most of the twenty four hour period. Diet comprised of roughage ie a variety of plants. Concentrates only available as seed heads formed. These seeds provide omega oils encapsulated within the seed wall therefore no oxidation of reactive fatty acids. Changes to diet were gradual and dictated by how far they moved per day. Horses eat for most of the twenty four hour period. 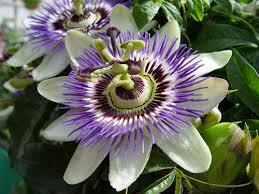 They had access to natural plant vermifuges that controlled parasites. They did not graze over parasite infested pastures or areas that contained fresh droppings. Look at eliminating refined oils from the diet in particular those added at time of manufacture. Omega Oils should be stored in glass in a cool dark place, used within 2 months of opening and only added to feed at the time of feeding. That you take care not to over load the system with too many concentrates, NSC or protein. Towards a more sustainable method of feeding, mixing your own feeds using ‘simples’ and starting to make a few changes to the pasture and surrounding environment, here are some suggestions. Unlimited access to Meadow Hay. If your horses present with respiratory problems soak it well prior to feeding. Either boiled or freshly crushed barley. One ice cream container depending on size of horse. If your horse heats up on barley replace barely with boiled brown rice. For those horses that don’t get heated up on oats 2-3 cups daily fed over 3 feeds in a day. Half a cup of flax seeds either freshly ground daily (these cannot be stored except in a sealed container in a freezer) or boiled slowly along with the barley or rice. Half a cup of soaked or better still sprouted, fenugreek. 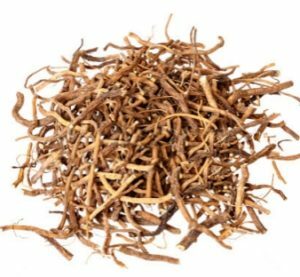 Fenugreek will help protect the non glandular part of the stomach and digestive tract with its mucilaginous properties. It is a fattening feed without heating. For additional fibre and filler that will help feed the hindgut copra is OK provided it has not been sprayed within 6 weeks of harvest. Beet products can be used but make sure it is not GMO and you are sure that the crop has not been sprayed in the last 6 weeks prior to harvest. 1 tablespoon of sodium chloride (plain table salt). This will counteract any excessive levels of potassium found in some pastures. 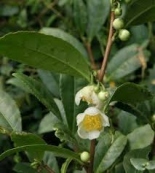 3-4 tea bags of Green Tea. 15ml of an Omega Oil Complex. One cup each of stinging nettle, cleavers and dandelion cover with boiling water and add to feed . Freshly sprouted legumes and wheat which act as natural chelators. Protein 10% by weight Excessive intake: potential problems ie increased water requirements, urea in blood and gut increase, ammonia, heat production. Pastures with clover and legumes provide protein as does soya meal. Caution required in feeding soya products to check that they are not GMO. Caution is required in supplementing with minerals in the correct ratios. 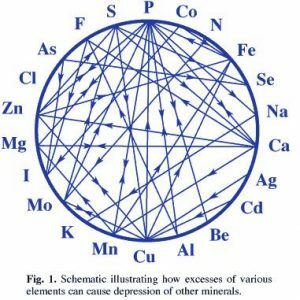 This diagram illustrates the interrelationship between each of the minerals ie Calcium (Ca) with Magnesium (Mg) Potassium (K) with Sodium (Na) Iron (Fe) with Copper (Cu) and Zinc. The two most commonly and generally safely administered mineral are Magnesium and Sodium chloride. Much of the problem with poorly balanced minerals lie with soil composition, its parent rock, the pH and the levels and biodiversity of the soil biome. Herbs are effective in altering neuro responses but should not be given in conjunction with veterinary medication. May interact with other medications and/ dietary compounds. 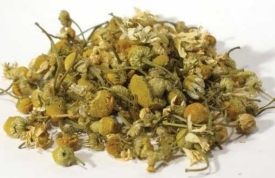 Chamomile helps calm the digestive system and it can be given as a dry mix or as an extract. Valerian is an effective natural sedative and may be given when required to help settle the horse. 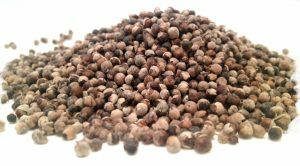 Vitex agnus may be used for endocrine issues, adrenal reactivity, elevated cortisol levels and anxiety. Other sources of digestible fibres , branches and bark, coarse seed hulls, stalky seed heads. Fats and lipids are an essential part of a horse’s diet though care needs to be taken to keep the ratios correct. While fats occur naturally in seeds which horses will forage, they can be added to the horse’s feed. Coconut fat is one of the very best to add to the feed and can be added grated over feed. The ulcer recipe can be modified by omitting the sodium bicarbonate. Half a cup of this blend once refrigerated can be grated and easily mixed into you horse’s feed. Avoid fat fortified feeds that have polyunsaturated oils or worse omega oils added. The manufacturing process will destroy these sensitive oils and create pro-inflammatory transfats. Omega oils are naturally found in whole seeds and the oil is protected by the seed coat. Once this is broken oxidation tales place. Controlled studies showed show that diet higher in fats seems to be protective against damage to genetic damage which in turn protects against cancers. Fats appear to lower muscle damage through micro-inflammation.